Release the Iron Age One! : What's happening to the Turoe Stone? Even though I grew up only a few miles away from the famous Turoe Stone, I’ve only visited it a small number of times. 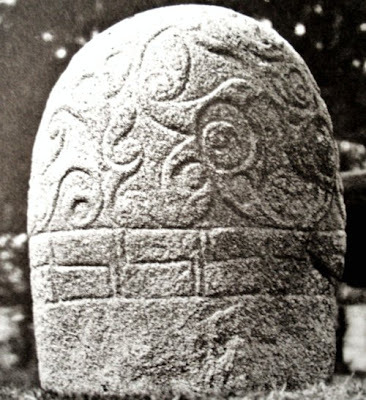 If you’re not familiar with it, the Turoe Stone is the largest and most complete of only a small group of La Tène decorated stones, which include Castlestrange, Co. Roscommon, and Killycluggin, Co. Cavan. All this meant very little to me when I was a child – as far as I was concerned, it was just a big stone in a field somewhere … it was the west of Ireland … we had loads of them! It was only when I got to university that I first got to visit it – on an Archaeology Society field trip, led by the late Prof. Etienne Rynne. A few years later I managed to get out there again, this time in the company of Daniel Büchner (check out his publishing company: Currach Bhán Publications [Website | Facebook]). Judging by the Turoe Pet Farm website, this must have been around 1993, as I have a distinct memory of the pet farm having only recently opened. 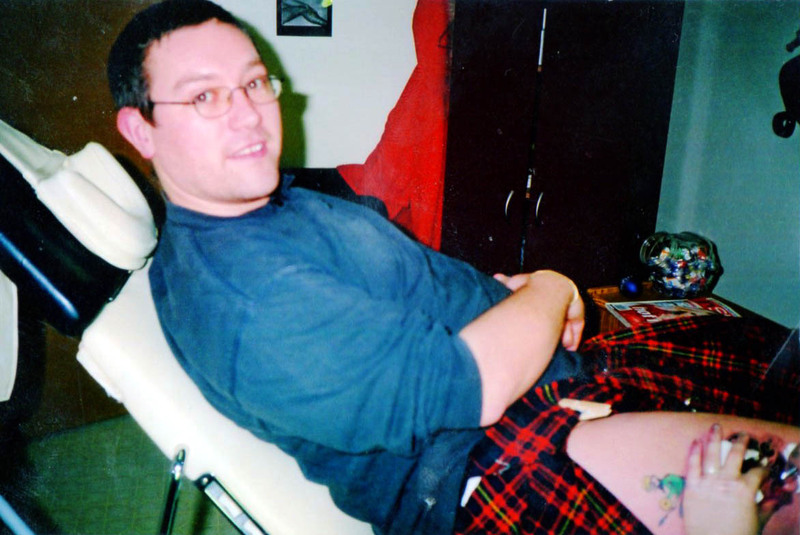 OK – I’d only been there twice, but both as a student and professional archaeologist, it had a very large place in my heart and mind – so large, in fact, that I chose to have one side of it tattooed on me. A much younger (and much thinner) me being tattooed with an image of the Turoe Stone ... around Summer of 1997, I think. Yes, I am wearing a kilt. And, yes, the other tattoo you can see is the famous warrior with shield and spear from the Book of Kells: Fol. 200 R in the Genealogy of Christ, Luke 3: 22-26. Adventures in body modification aside, 1993 was the last time I was there … right up until last summer (2012). My family and I were spending a few days in Galway with our relatives and the idea of bringing the children to the Pet Farm (and its 8000sq ft bouncy castle – apparently the largest in Europe) together with combining it with some good, solid Iron Age archaeology seemed to be a deal too good to beat. In doing a quick Google search to check on prices and opening times, I noticed that among the well known images of the stone there was the occasional image of a somewhat ominous-looking shed, but I thought nothing of it … it’s just one or two pictures amongst so many – I was sure that there was a reasonable explanation … after all, there were pictures of the Castlestrange stone and a peculiarly tasteless Turoe Stone clock, too. I’m all in favour of careful and considered conservation for this internationally significant stone – but this sign is dated 2005 – eight years ago! How much monitoring of its condition do the OPW need? From what I can gather, it’s not as simple as that. There appear to be moves afoot to relocate the stone, either to Galway City Museum [Website | Facebook] or the National Museum of Ireland [Website | Facebook]. Obviously, there is significant local opposition to any move – It’s called ‘The Turoe Stone’, after all! I can certainly sympathise – it is part of this place and part of this landscape. The other side to the story is that it has been moved at least twice from its original position at the Rath of Feerwore, so it’s exact location has been somewhat compromised. On the other hand – it is a stone not just of local – or even national – significance, but of international importance, and it deserved to be correctly curated and displayed. Does that mean it could or should be moved? Everyone is entitled to their opinion, but mine is that it should not go to Dublin. In the NMI it will be one beautiful, interesting, and important artefact among so many. However, I’d prefer to see it in Dublin before it was moved to Galway. Galway Museum, in my opinion, is nice in so far as it goes – from what I’ve seen it is a space used for poetry readings, musical performances, and photography exhibits (or at least that’s my experience). Don’t get me wrong – these are all fine endeavours, but they are not the point of a museum. Their display of prehistoric artefacts is tucked away like an afterthought in a corner on the ground floor. Galway possesses one of the best collections of medieval carved stone on this island (brilliantly catalogued by Jim Higgins), but (unless things have changed radically in the recent past) none of it is on display. At least in the old museum, for all of its faults, it was all there to be viewed. The first time I visited the museum, an entire large gallery was taken up with a gibberish display of the history of the city as if it had been told through bite-sized headlines in tabloid newspapers. So … no … I don’t like it and … no … I don’t think that it can be entrusted with something as important as the Turoe Stone. As I say, that’s my opinion. So what do I think should happen to it? I believe that there are a number of viable options – but it depends on someone in authority having the vision (and probably a brass neck) to see it through. In my opinion, the simplest option is to create an appropriate shelter and protection for the stone in its current location – it can hardly be beyond the ability of a competent architect to design something that allows the stone to be viewed clearly and still protected … my personal suggestion would be for something resembling an Iron Age/Early Christian house, but done in steel and glass … the vision I have in my head would be spectacular! Either way, something with a bit of flair and imagination that would give it the setting and protection it deserves. Going beyond just the stone itself (and this is where we need real vision) how about using this remarkable stone as the focal point for The Discovery Programme [Website | Facebook] (who better?) to carry out a multi-disciplinary research project on the stone, the Rath of Feerwore and the Iron Age landscape of east Galway. Obviously, the central plank in this approach would be a large-scale re-excavation at Feerwore, combined with extensive LiDAR and geophysical surveys. Joseph Raftery’s 1938 investigation (published in 1942) appears to have included the investigation of large portions of the interior of the site, though there may yet be more to be discovered there – especially from within the ditch and the area surrounding the presumed original location of the Turoe Stone. At the very least, there should be some effort made to track down the excavated remains (including the skeleton from the site) with a view to recovering enough material for radiocarbon dating. As I say, these are just my personal suggestions. What needs to be recognised is that we have one of the archaeological wonders of this island incarcerated in a garden shed. I don’t care how anyone tries to spin this story – this is what it comes down to. The Turoe Stone is locked away in a little shed with windows so filthy that you can’t even take a decent photograph. As I have said, I do appreciate that we need an effective and robust plan to curate and display this treasure for future generations – but eight years is too long! While this situation continues, the reputation of the stone, and Irish archaeology with it, will dwindle. In searching for information on this issue on Google, I came across the German version of Tripadvisor that has a page dedicated to this very topic. All of the five responses on the page lamented the current state of access. One reviewer specifically states: “The Turoe Stone is a great treasure, but don't bother to go see it” … how much is this one page (and there are others) damaging the reputation of the monument? How much is it damaging the reputation of this island as a place that treasures and protects its heritage? In the current economic climate, when every pound, euro, and dollar is needed – and when our heritage resource is seen as key in enticing tourists (well, they’re not coming for the weather, are they?!) – we cannot allow this shameful travesty to continue. To the OPW, I say: it’s time to get your act together. The garden shed – however much it protects the stone and allows monitoring of its condition – is a joke that is only eclipsed by the signage from 2005. The OPW need to resolve this situation immediately – there is no other way to put it! At that time I received two automated responses indicating that they had received my email and would be responding without delay. Their eventual response, if/when I receive it, will be posted here. To coincide with the publication of this blog post, I emailed them again [Friday May 17 2013]. "To whom it concerns,I wrote to you on on January 15 2013 inquiring as to the current situation and future plans by the OPW for the Turoe Stone, Co. Galway. I received an automated reply stating that I would receive a reply in due course. As of today - 17 May 2013 - that has not materialised. I include the text of that email below and would appreciate a formal response to it. All responses will be considered for publication on my blog post regarding this issue (http://rmchapple.blogspot.co.uk/2013/05/release-iron-age-one-whats-happening-to.html)." relevant Section within the OPW for direct reply. This is an automated response. Please do not respond to this e-mail." 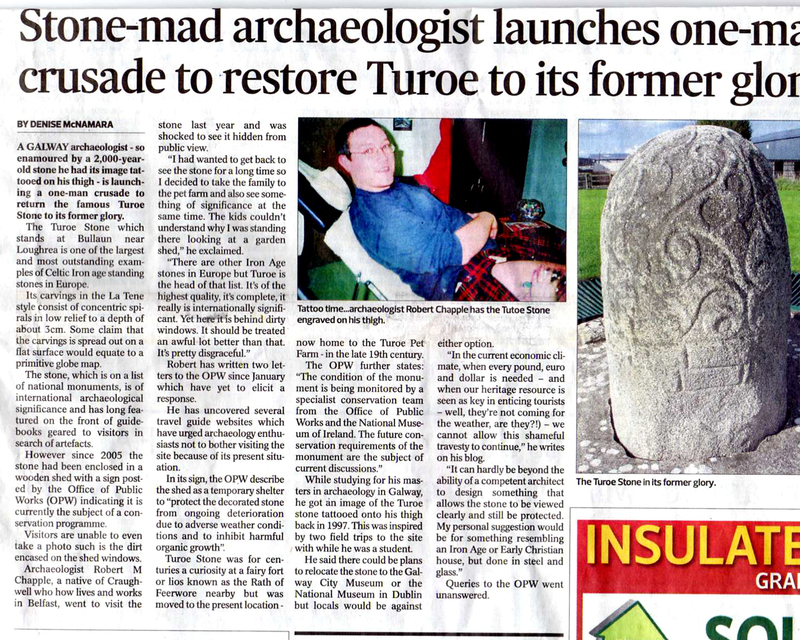 Connacht Tribune, Friday 24th May 2013: "Stone-mad archaeologist launches one-man crusade to restore Turoe to its former glory"
Sunday 26th May 2013: Facebook page Campaign for the Restoration of the TUROE La Tène STONE set up. 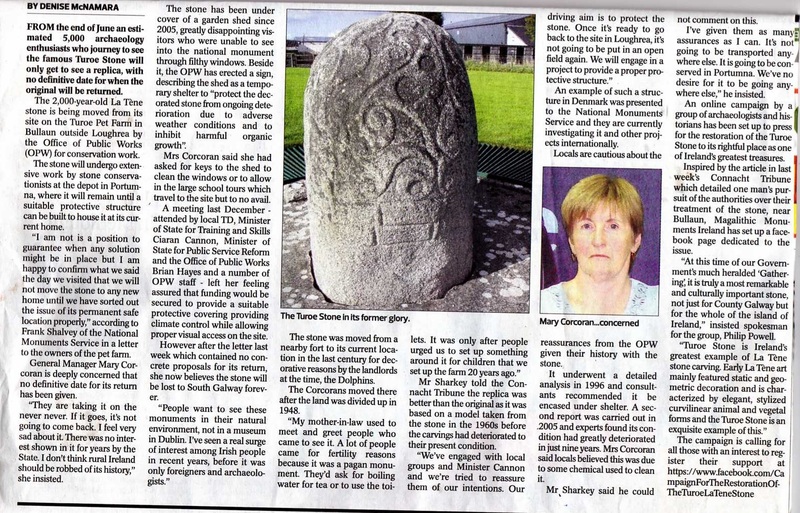 Connacht Tribune, Friday 31st May 2013: "Rocky times for Turoe Stone as replica replaces real thing"
The Turoe Stone, Co. Galway is currently not accessible to visitors. The highly decorated stone has been removed to the Office of Public Works depot in Athenry for urgent cleaning / conservation. Monitoring of the condition of the granite stone over a number of years had indicated damage and loss of carved detail due to weathering and mechanical abrasion. 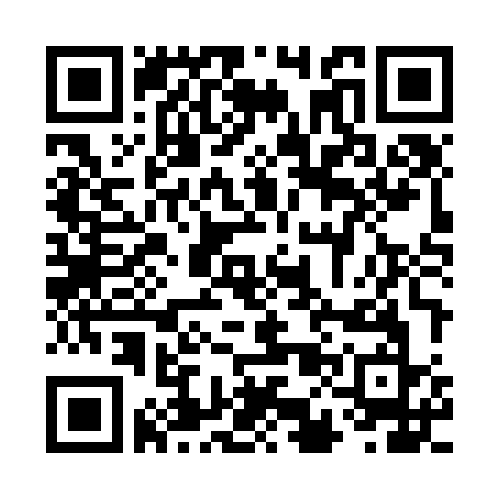 The opportunity is also being taken to undertake high resolution laser scanning and 3D modelling of the entire stone. Following conservation, it is proposed to return the stone to Turoe once a structure with the appropriate environmental conditions for its protection is constructed. I’ll endeavour to bring you more information if/when I find it!